There is no more revered and regarded event within our family’s weekly calendar than the meal which is so spectacular that it straddles the social norms for both timing and menu of TWO meals. It is serious and significant family bonding time for us. Yesterday morning at The Post, that family bonding hit a snag, people. 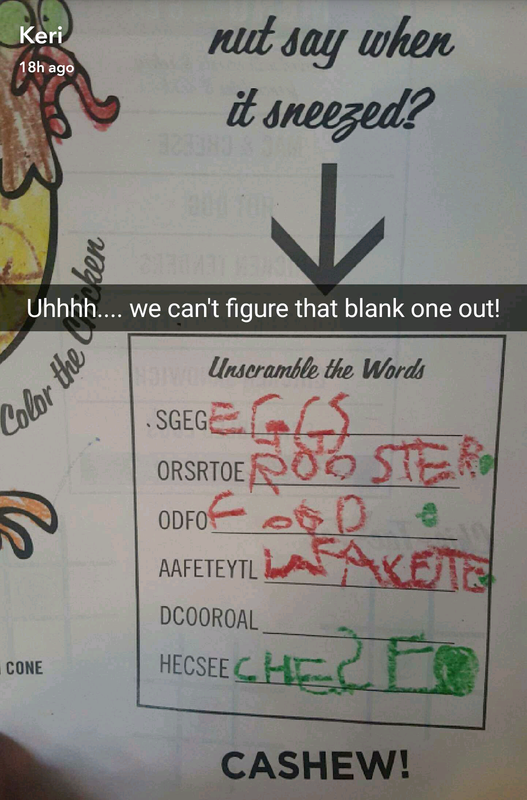 The entire damn family got stumped over the kids menu word scramble. We brought it home, but even minus the glorious glow of my Sunday mimosa, I am still at a loss. I have an English degree, damnit- IT’S A DEGREE IN WORDS, FFS!! Beat by the brunchy kids’ menu…. That’s a low even an extra mimosa (almost) can’t repair. Tagged as brunch, family, humor, Jr, Just Sayin', The Mr. I really can’t get that last one. But my burning question is…Lafayette?!? I’m thinking Colorado. Because, um, it’s the perfect place for brunch?! It’s totally Colorado! And now I’m like COME ON KERI!